Waves Audio has followed up its Vocal Rider plug-in with Bass Rider, which reportedly rides bass levels automatically. Said to deliver “perfect” bass levels, the plug-in is optimized especially for the frequency range and envelope characteristics of bass instruments - DI, amplified, acoustic, synth, upright and so forth. Bass Rider is aimed to keep bass levels in check and solid throughout a mix; unlike a compressor, Bass Rider is said to work note by note without disturbing their inner dynamics so they sustain and decay naturally. The plug-in has dedicated studio and live components and offers up to 24-bit 192kHz resolution. There are also mono and stereo components, it supports TDM, RTAS, Audio Suite, VST and AU; and is both PC- and Mac-compatible. The variety of controls on the plug-in oversee various functions. 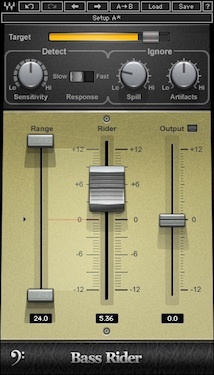 According to Waves, the Target Energy Meter shows the energy of the input signal; the Target Slider sets the desired bass level range and calibrates the Rider Fader “0” position; Sensitivity controls the note detector sensitivity; Response controls the note detector response; Spill controls the amount of spill that the detector should ignore; Artifacts controls the note detector’s tolerance to artifacts; Max Range sets the upper boundary of the Rider Fader movement; Min Range sets the lower boundary of the Rider Fader movement; Rider Fader is Bass Rider’s automatic fader control; Output trims the vocal output gain, post-auto riding; Idle Arrow sets the Rider Fader value when there is no bass activity; and Effective Range displays the total gain range available for automatic riding.